Indeed. 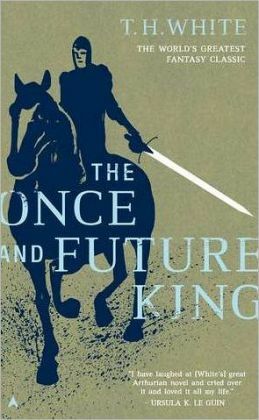 Another book about King Arthur, retelling the epic tale of chivalry, treachery, and death. You’ve probably heard it all before, right? Well, you haven’t heard the true story of King Arthur, really, until you’ve read this delightful tome of legendary reimagining. It is a perfect novel for older children who like long, edible reads filled with historical and literary anecdotes. In this novel, we meet the cast of King Arthur’s tales as real people: arrogant boys, narcissistic mothers, and paunchy, relatable uncles. King Arthur, originally a boy named the Wart, is taken through exciting and unique levels of schooling at the hands of his pepperpot teacher Merlyn. T.H. White brings us the tale of King Arthur in a homely, earthy, and satirical way that blends the gentility of E.B. White with the edgy wit of George Orwell. He paints an in-depth, personable, and sometimes startling picture of the life of King Arthur and all the players that engage in the realm of Arthurian legend. What I loved a lot about this book is how effortlessly T.H. White captures the essence of what it means to be a child growing up in large, confusing world: the young Wart’s foibles and flounderings through lessons, friendships, and eventually, young adulthood, are painfully raw and very easily relatable to whatever trials a modern-day youngster might find themselves going through. The lessons that are imparted upon the young future king — lessons about each man remaining true to himself, about avoiding witches, about keeping “sin from coming home to roost”, are poignant ones that should be of no less importance today than they ever were in any past era. I also loved how T.H. White didn’t neglect to delve into the lives of the darker half of Arthurian legend. He takes us into the skeletal and slippery home of Morgause, and introduces us thoroughly to her troubled and conniving sons. We get to see, alongside the development of Arthur’s character, the growth and blooming of the death and discord that haunt Arthur through his life and ultimately to his death. T.H. White does a particularly good job of conjuring up and painting the portrait of Mordred, the fated, fateful son of Arthur and Morgause. Mordred is presented in such a crisp, humanistic light that the reader almost can’t help feeling sorry for him — and hating him — at the same time. Also painted very humanistically and honestly is the relationship between Lancelot and Arthur’s queen. We get to see, personally and intensely, the shame, torn emotions, and sorrow caused by the couple’s illegal love. The added twist of Lancelot’s ugliness makes him a deep and realistic character, as does the Queen’s well-expressed and blatant jealousy. None of the characters feel shallow in this book at all. T.H. White also takes care to impart a nice amount of humor in this book, softening some of the harsher chapters of his epic novel. Quips about Latin abound, humorous incantations of ‘hic, haec, hoc’ and more; and what’s not to love about the wise, crazy ramblings of Merlyn and his entourage of enchanted pets? How could one not laugh at the candid descriptions of boys doing mock-battle or brothers squabbling? This book is a tome that perfectly encompasses the life of a rising king — his childhood, his friends, and everything in-between that weaves the fabric of his coming power, greatness, and eventual downfall. T.H. White strikes perfect balance between sweet and bitter: he portrays the story of Arthur with a careful touch and beautiful honesty that young readers should be able to resonate with and appreciate. Considering how long the novel is, T.H. White has done an excellent job of weaving a tale so tight and so memorable that the reader doesn’t feel lost or bored. Nor does his work feel dusty or overly bombastic, as many Arthurian retellings can. He cuts to quick and delivers exactly what children would adore.